Vital Link is thrilled to announce the 2018 STEM and the Arts Career Showcase held from Friday, April 13 to Sunday, April 15 in conjunction with the OC Fair & Event Center's Imaginology. 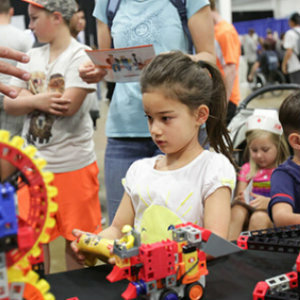 Join over 6,000 attendees as families, students, and educators come together to explore and engage in hands-on activities, workshop presentations, interactive exhibits, and fast-paced competitions. The STEM & the Arts Career Showcase is an annual three-day event that gives students the opportunity to explore career pathways in STEM fields. The program brings together industry professionals, educators, and college representatives that provide students the opportunity to explore their future. The program includes student competitions and displays, industry demonstrations, career exploration exhibits, industry speakers, a job recruitment area, live entertainment, and more! This family-friendly, fun-filled event will leave you excited and inspired to Explore, Discover, and Connect with their future career. The free event is open to the public on Saturday & Sunday from 10 a.m. – 4 p.m. at the Costa Mesa Building #10.